There are a lot of visual schedule applications on the market, so it is good to know what is out there. I have already reviewed two visual schedules on my website. First Then Visual Schedule is an easy to use visual schedule creator that comes with lots of pre-installed images. Continue reading to see how this application stands out from the rest and enter to win a copy of this application! The Main Page of the application shows the different First Then schedules. You can also access the Image Library, Recording Library, Settings, and New Schedule pages. Shows all of the pre-installed images that can be used for schedules within the application. This is where files of all the recordings created within the application are saved. Press the "+" button in the top left hand corner of the page to create a new schedule. You can then duplicate a whole schedule to edit or start a new one. Press within the rectangle to add a title to the schedule. Next, add an image to the title of the schedule by choosing one from the stock images, Image Library, Google, or Camera. 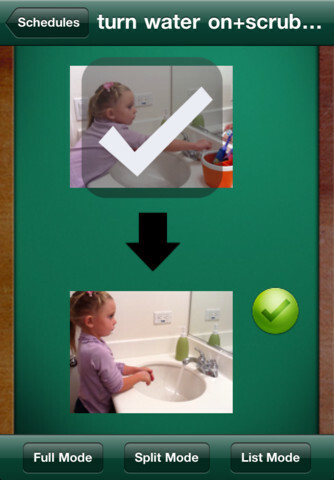 Then, press the "+" button to choose an image for each of the steps. After that, add a caption by pressing within the rectangle and typing on the keyboard. Finally, add a sound from the stock sounds or record a sound. 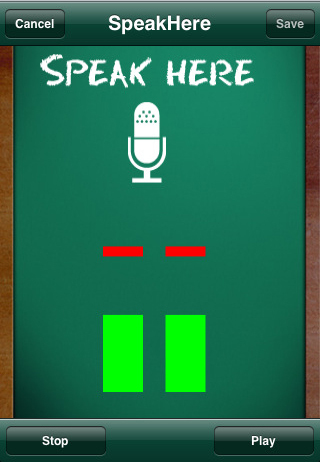 To record a sound, press the "Record" button. Then, press "Stop" and "Play" if you want to hear the sound played back. Press "Save" once you have chosen the image/sound for the step. Add more steps by pressing "+". Full Mode - Shows one image at a time and you can get to the next step by swiping right to left. Split Mode - Shows two images at a time with an arrow pointing to the next image and showing the text of the task at the top. Swipe down to up to see the next step. List Mode - Shows all images/steps in a list format. There are so many pre-installed images on this application that it is easy to set up a schedule! You can record your voice to go along with the images on the schedule for students who have difficulty reading. Images and text make the application easy to follow for students who need visuals. You can add your own images to visual schedules unique to your clients. You can save multiple schedules to the application for future use. It would be great if there were already recordings for pre-installed images for creating a schedule. 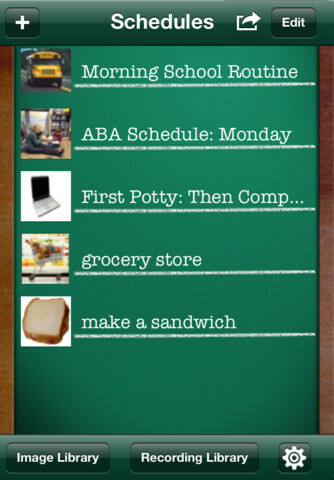 Visual Schedule - Visual schedules are perfect for children with anxiety and who have an autism spectrum disorder. Visual schedules make transitions easier to manage and it is easier to understand what is coming up next. Sequencing - Discuss steps to complete a task using this application. You can also discuss the sequence of events within the student's day. 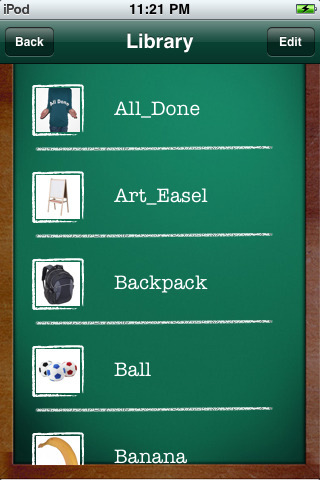 First Then Visual Schedule is available for the iPod Touch, iPhone, and iPad for $9.99! 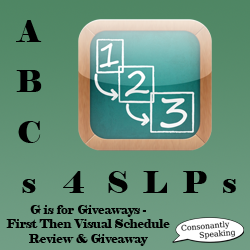 Consonantly Speaking was given a copy of First Then Visual Schedule to give away with this review. No other form of compensation was given. Enter the giveaway below for your chance to win a copy of First Then Visual Schedule! Please click here to view Consonantly Speaking's policies and disclaimer before downloading and/or using content from this website or e-mailing the creator of the site. Consonantly Speaking is owned and maintained by a licensed speech-language pathologist in her free time after work at a public school. There are monetary and time costs to maintain this website. If you find any of the free materials or ideas on this website helpful, please consider donating what you feel the free materials that you have used are worth. Thank you.